How are imported goods auctioned? What happens to the goods imported not claimed by importer? What happens to imported goods, if not customs cleared by importer? Who is the owner of imported goods if not cleared by consignee? What is the difference between confiscated goods and un cleared imported goods? I have explained the difference between unclaimed and un-cleared imported goods, in my previous articles. The custodian of cargo, arrange to prepare a complete stock of goods and files with customs for necessary ‘no object’ approval to resell the product. If the imported cargo contains any goods prohibited to import, the particular cargo will be withdrawn from resale or auction, as the ownership of these items are transferred to customs department which falls under ‘confiscated goods’. Customs department is responsible for disposing of such goods. While scrutinizing the list of items, customs department withdraws the goods which are falling under the subject matter of any investigation or adjudication or court proceedings. 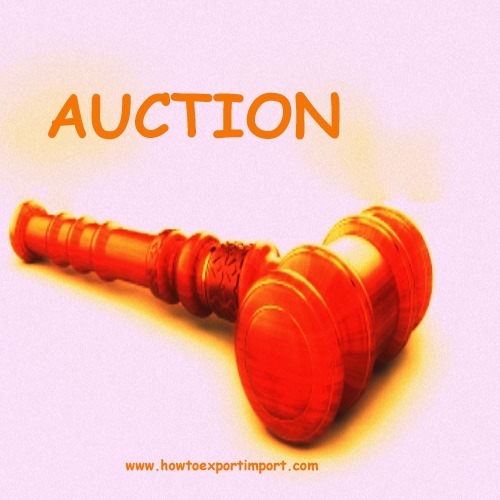 After receiving ‘no objection’ from the customs by custodian, the public auction procedures are undergone. The fair price of goods determines by customs by taking in to consideration of import duties. The auction is undertaken with the presence of customs officials. The ‘reserve price’ for auction, fixed by custodian with the approval of customs includes duty amount also. If the first auction not taken place due to increase of ‘reserve price’, the said reserve price is reduced in the subsequent actions. If the goods could not sell with subsequent auctions, the cargo will be sold by calling tenders. Do you wish to add more information about auction of imported goods / auction of un cleared goods/ auction of confiscated goods? Share your experience below about the procedures and formalities in handling imported goods which are confiscated/un cleared? Write below your thoughts about this article - The formalities to sell / auction unclaimed or un-cleared goods. Surendran Kollerath: On 09 March 2014 Hi Kriya, As per my knowledge, the consignee can not attend auction on unclaimed/abandoned goods. n.ramu: On 02 May 2014 what is the way to find the list of goods actually auctioned by mumbai sea port? is it possible to find information on goods which may have been auctioned as far back as 10-12 years? thanks for guidance. ankit batham: On 21 August 2016 mujhe bhi custom k auction me khridna h to kab hai auction ? can u please tell. Hardik Patel: On 27 August 2016 How to purchase unclaimed stocks from customs? How we come to know? Is there any specific website for auction? Please let me know. akshay agrawal: On 29 September 2016 Respected Sir, I have heard that the product which has been seized by the Indian Custom, it has been sold through E-auction and may be sold through tender. I searched over the internet and I found somewhere seized products are sold through www.quickr.com. i would like to know more about it and please tell me from where could I get the details regarding it. I searched over internet (in Google), where I wrote in the search box "Indian Custom Seized Goods Sale". The output was consisting of many site links. It is hard to say that all of them were genuine. I live in Howrah (West Bengal). If there is any website or any Indian Custom Seized Goods Shop or any other related details or any other source from wherein I can take details about the Indian Custom Seized Goods.